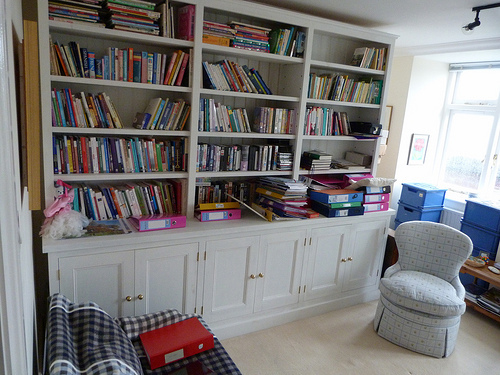 Home Costs > How Much Does a Built-In Bookcase Cost? How Much Does a Built-In Bookcase Cost? Unlike a traditional bookshelf that sits in a room taking up space, a built-in bookcase is installed within a wall, as in the picture below. Built-ins are a great way to provide ample storage and even maximize your space. The cost of a built-in bookcase will depend on the size, the type of wood being used, the complexity of the job, the contractor if one is hired and other factors. How much does a custom built-in bookcase cost? On average, depending on the cost factors mentioned below, the professional installation of a built-in bookcase is going to cost anywhere from $2,500 to as much as $8,000+ or about $150 to $375 per linear foot, sometimes even much more, again, depending on the factors involved. A lower end straightforward out-of-the-box design with standard grade veneer plywood could cost about $1,500, whereas a customized design with drawers, doors made from oak could cost much more than $6,000. The estimates given by your contractor should include cutting out the sides, back and the base to create the built-in unit. The shelving, frame, sanding, paint/stain and adding the trim should be included as well. Before the job starts, a contractor will be able to help you plan your layout, purchase the materials, prep the area and clean up after the job is done. These inclusions, however, can vary from one contractor to another, so be sure to get everything in writing before proceeding. Since this will be a unique job, it’s best to get as many quotes as you can to see what you should be budgeting. Even if you don’t know where to receive a quote, we highly recommend HomeAdvisor.com to get free quotes from local reputable and licensed contractor. It’s free to use and you could receive quotes in minutes. If you want to add accessories to your book shelving, aside from the shelves, such as drawers, cabinets, molding, a coat of paint, doors and/or windows, then this can add to the overall costs. If any of these accessories were larger than the standard size, then more labor could be involved, depending on the scope. Bookshelves can either be created by a pre-made kit, semi-custom kit and can be done as a 100 percent customized job. As with anything, a custom job will be much more than a kit in a box. The complexity of the design and size are considerations to consider. This can include the height, depth, and width, plus any awkward details such an arch or unique header. Larger sizes mean more materials and labor. Local labor fees, if you were to hire a contractor, will affect the pricing as well. The type of labor can affect the price, too. For example, a handyman can cost less than an experienced carpenter. Built-in bookshelves can be made by a variety of materials, including birch, douglas fir and plywood, and each type will vary in price. Veneer plywood, often the cheapest option, is recommended because the softer woods, such as pine, won’t sag over time. Oak, a premium material consideration, can be up to two times more than the veneer plywood. If a contractor needs to remove molding, flooring and/or parts of the ceiling, then the costs can start to raise, depending on the complexity of the factors already mentioned. Some contractors won’t include the stain/paint in the final quote. Custom colors and/or more than one color could increase the costs as well. The standard built-in bookshelf is usually eight feet tall, but if you were to raise the height, the costs could increase by more than 30 percent. Adding paint to the trim and/or shelving can be another few hundred dollars, depending on the size. Avoid choosing a softer wood as it can sag over the years. Installing lighting can be an additional $50 to $150 per light. Adding a door can be an additional $200 to $400, but glass doors can be about 50 percent more. For every drawer, plan on spending $100 to $200. Some homeowners opt to install an electric fireplace into the shelving, which can increase the costs by $500 to $1,500+, depending on the fireplace setup. Pay close attention to the wood you plan on using to ensure the shelving can hold the weight being placed on it. If using a handyman, you may be able to save money if you combine other household projects at the same time. When hiring a contractor, always make sure you get at least three to five quotes before proceeding. When hiring, always make sure the professional is licensed, insured and has a positive rating online.